Home > Tama Software Ltd.
Found 10 file extension associations related to Pepakura Designer and 1 file format developed specifically for use with Pepakura Designer. Pepakura Designer allows you to create paper craft models from 3D data. Pepakura Designer is developed in Japan and has been translated to English. We encourage you to create original designs and respect the copyrights of others. This software is open to the public as shareware so you can download and try it freely although some advanced features are limited until you purchase a license key. Note: Pepakura Designer does not contain software to create the original 3D models, but instead translates them to a 2D printable format. 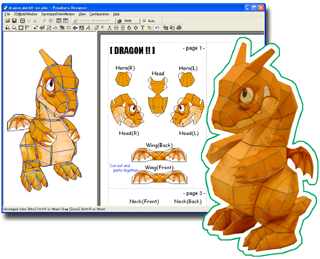 Pepakura supports some 3D file formats from software such as 3D Studio, LightWave and Softimage. Pepakura also supports files in the freeware format from "MetasequoiaLE". If you need more information please contact the developers of Pepakura Designer (Tama Software Ltd.), or check out their product website.